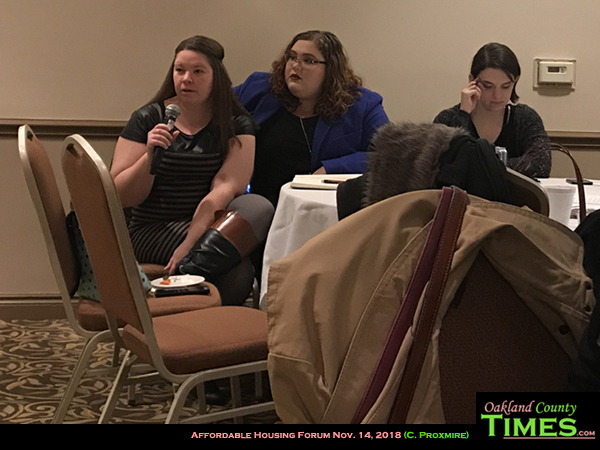 Troy, MI- As rental prices continue to increase throughout Oakland County, so too are the problems associated with homelessness and housing instability. A panel of leaders from various organizations met Nov. 14 in Troy to look at the scope of the problem, and what communities can do to help. 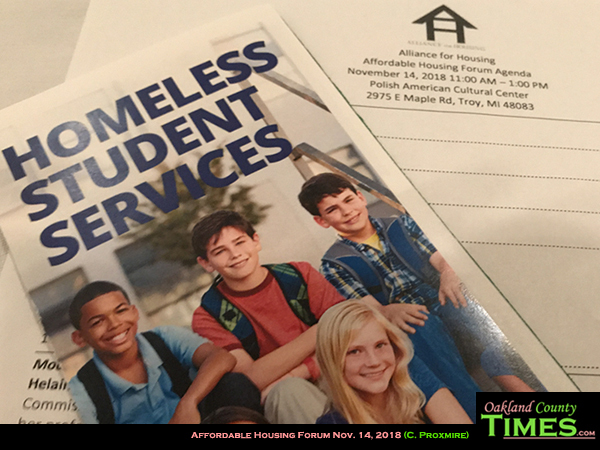 In addition to funding and planning, “It really is about building public will,” said Beverly Ebersold who is Director of National Initiatives for the United States Interagency Council on Homelessness. 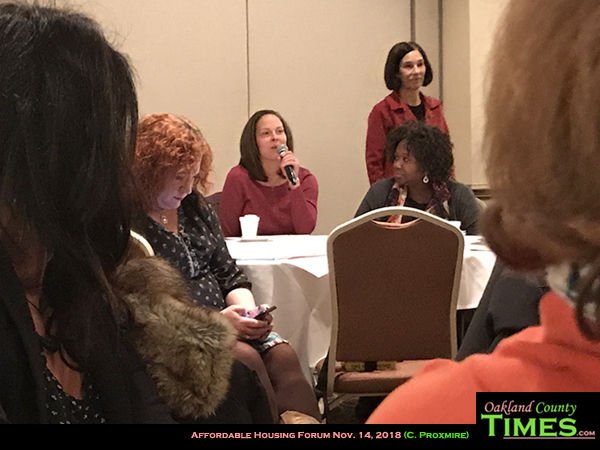 She noted that while affordable housing is in severely short supply, it’s a problem that many may not see unless it impacts them or someone they know. Beyond that, even when someone struggles to find an apartment, they may not see the bigger picture. That bigger picture means that for every 100 people with low incomes, there are only 66 units of housing available in their price range. Area agencies report increasing instances where people have housing vouchers not being able to find apartments. And even people who are working and not receiving assistance are struggling. The Department of Housing and Urban Development (HUD) says that housing should cost up to 30% of a person’s income. So for example, a minimum wage full time worker would bring home about $1,500 per month. That means that “affordable” rent would be $500 or less. Many institutions use percentage of income as the standard. Other agencies base “affordable” on the median household income of an area, and where the person’s income level is in relation to the median. For example, if a developer is required to include affordable housing, that rate can be determined by looking at the median income of the city and determining what percentage below the median people would need to be in order to qualify as low income (generally 60-80%) and then setting the price to 30% of that income. Housing prices and income levels vary by area. In some places $1,000 a month for an apartment would be outrageously high, in others it would be outrageously low. There is an idea that people should move to places that can afford. But every community needs workers of varying income levels. In cities where workers cannot afford to live, there are challenges finding employees. This is particularly true in the service industry, where jobs may be clustered in prosperous areas but there are not homes nearby for those workers to live. The problem also affects the aging population. As older adults hope to move into smaller spaces without the challenges of home and yard maintenance, or the obstacle of stairs, the demand for affordable apartments has been increasing. 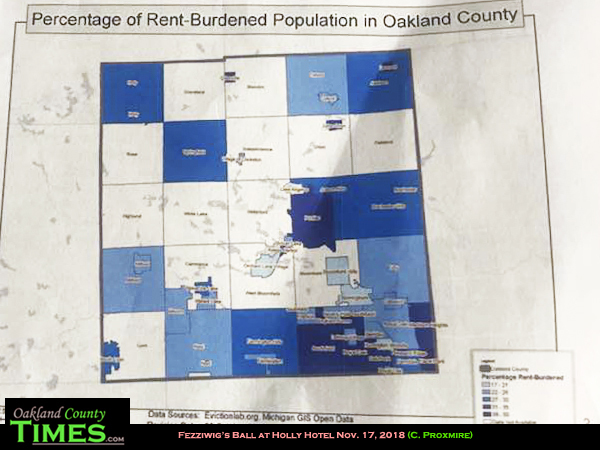 In Oakland County, Pontiac, Hazel Park, Leonard, Ortonville, Oak Park, and Southfield are the hardest hit, with 31-50% of residents being “rent-burdened.” Other areas with over 25% include Holly Township, Springfield Township, Rochester and Rochester Hills, South Lyon, and Ferndale. 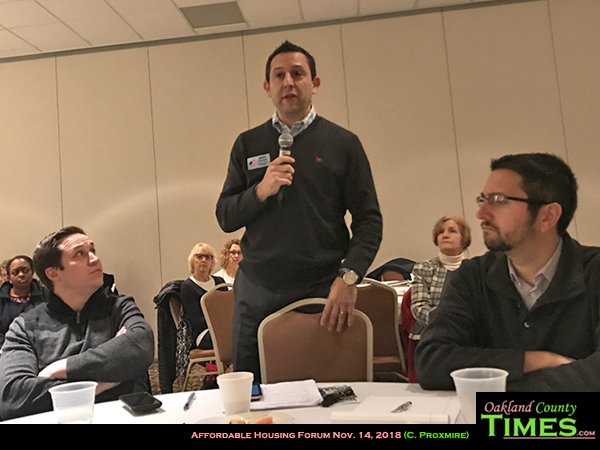 “Affordable housing had developed a negative connotation,” said Marc Craig, President of Community Housing Network. “It’s not just for homeless. It’s for people who teach our kids; for police officers; for people who work in retail. It’s not only for people who are low income. It’s for people who are low and moderate income. Changing the stigma is one of the ways to increase public support, Craig said. Yet the problem of homelessness is also pervasive. Sara Orris works with Oakland Schools as a Homeless Student Education Facilitator. She said there are about 6,000 kids in Oakland County who are homeless, couch surfing, or crammed into over-crowed apartments where they could face being on the street again at any time. The affordable housing shortage is not getting any better. 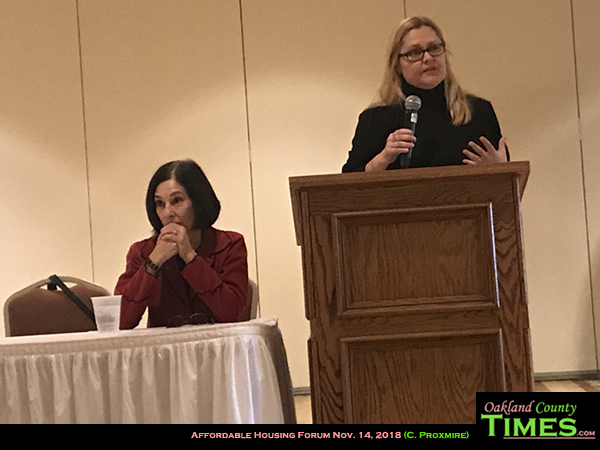 According to the Alliance for Housing, “The Low Income Housing Tax Credit (LIHTC) program is Oakland County’s primary method for developing new affordable housing units…There are approximately 30 LIHTC projects with 3,700 units in Oakland County. Over the last five years, the percentage of new Michigan LIHTC housing units being funded in Oakland County has decreased from 11% in 2013 to 6% in 2018. Efforts to support affordable housing include preserving current stock and building more units. And it’s important for civic leaders to have housing on their minds when it comes to development potential. 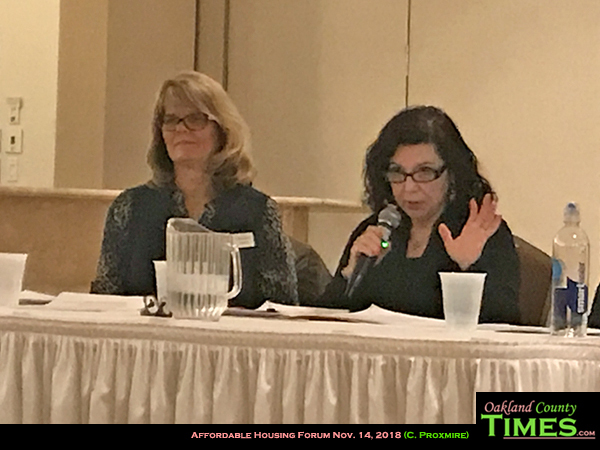 Pieces of that puzzle including having good relationships with builders and developers, making changes to zoning to allow more rental properties, look at land use regulations, parking requirements, permitting process, incentives and simply making sure the process is streamlined so developers will want to build. Cities can include housing goals as part of the Master Plan, and administrators can push for developments to have higher density. “You may find a site where you can fix a building and add six units, or you can build new and add 56,” she said. One project that was touted by panelists was the Jefferson Oaks project in Oak Park. The land was formerly owned by Ferndale Schools. With 60 units of affordably-priced townhouses available, their interest list topped 2,300 people before the property was even ready for occupancy. He explained that as developers invest in projects, it makes sense to build homes, condos or luxury apartments. The return on investment is much higher, and the public resistance is lower. That is why incentives are a key in attracting affordable housing projects.